My Weekly Spock: Shuttlecraft Designer! Sorry I’m late this week, but work is getting busier, and on Monday I had the pleasure of seeing Bernie Sanders at a rally in my home town! For this week, I found this wonderful rare promo shot of Leonard posing with the (mighty handsome) designer of the Galileo shuttlecraft designer, Gene Winfield! I recently acquired a bunch of rare slides from a dealer on eBay which came from the Celebrity Photo Agency in CA. 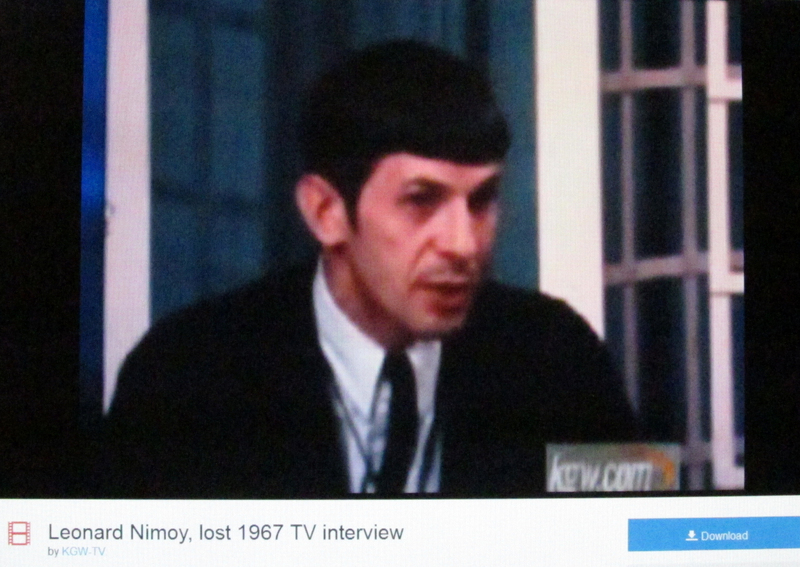 Naturally I bought three pages of rarely seen Nimoy images to share here! Pardon the quality of the image — this is just a quick scan of one of the slides, and when I get these converted to prints, it will look much sharper and brighter. This was taken of Leonard at a book signing at Brentanos on October 30th of 1995. More to come in time! Enjoy! Wideo Wednesday: A Very Rare Interview with Leonard in 1967, KGW-TV. Kudos to reader John Webb for alerting me to this!